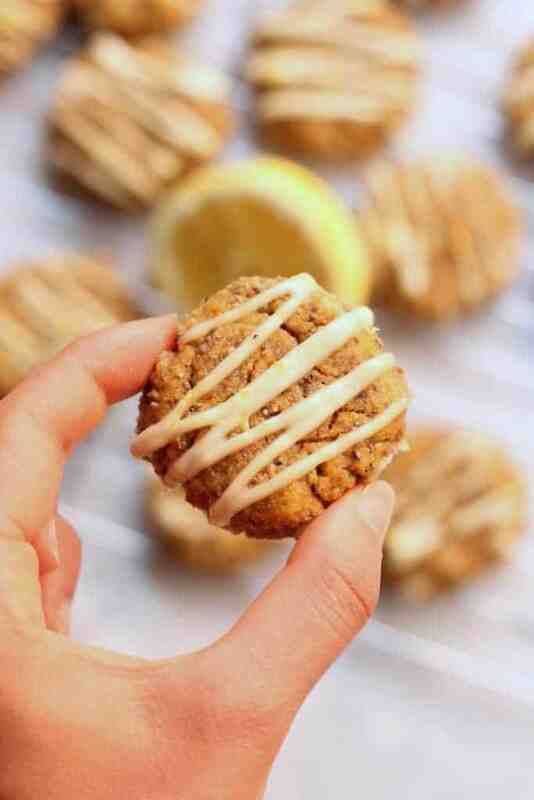 Enjoy a few of these easy, healthy, and delicious Flourless Lemon Chia Cake Cookies as a snack or treat! They’re soft, pillowy and perfect for vegan, paleo, and gluten-free diets. I have a confession t’make. I wanted so badly to defy gravity this weekend and do everything except lay face down in a pillow in my fluffy hot bed all day but sometimes the universe has other plans. And on one of the most beauteous weekends 2017 has yet (not to mention the opening of TRISM!! ), the universe just had to bestow upon me a postnasal drip fit for a queen. It hit me like a tonna bricks Saturday morning. Not even my most favoritest iced coffee and egg sammie could fix it! But listen here. I think this not debilitating but considerably annoying cold of sorts is a lesson in disguise. Sloooooooow down, ya crazy woman. So I listened to Present Over Perfect on Audible. I watched almost every episode of The Keepers. I ate the best salt and vinegar chips and brownies and Amy’s burritos and chips and salsa. I was forced by the universe to stay in with me myself and I and I actually weirdly enjoyed it. I think the forced slowness was exactly what I needed. Obviously it’s also about to be that time of the month (thank you, universe) and in addition to my hormones flying in every which direction, I’ve also been having massive cravings. Like I need a spicy dill pickle and I need it right effing NOW. Is a shoe craving a thing? Because I’m salivating over these lace up sandals. And these barely there sandals. I meeeeeean. And then there’s the sweet and sour cravings. Not like Warheads sour candy (omg who remembers those!!) or sweet and sour chicken, but like sweet lemon cookies. 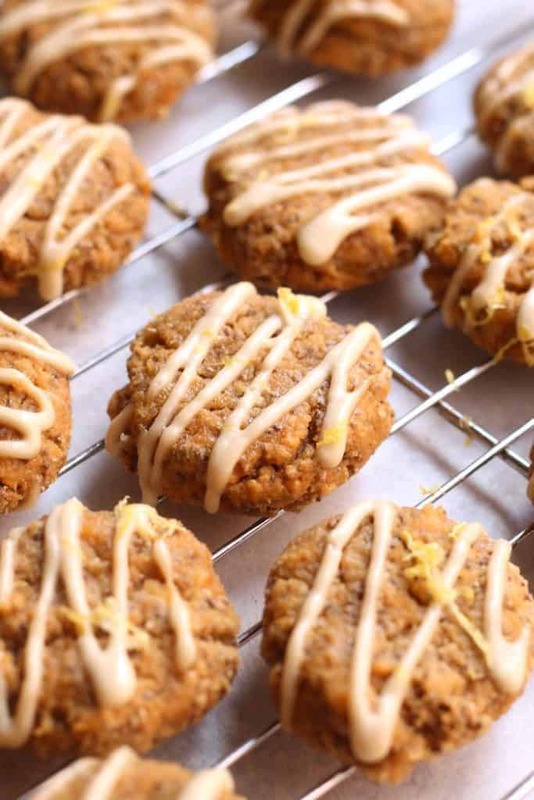 LIKE LEMON CHIA CAKE COOKIES. With the creamiest dreamiest lemon glaze made with cashews, of all things. I’ve never met a glaze I didn’t like yet I’ve never actually posted a glazed cookie recipe on the blog. It’s safe to say that I see a lot of cookies and a lot of glaze in my near future. 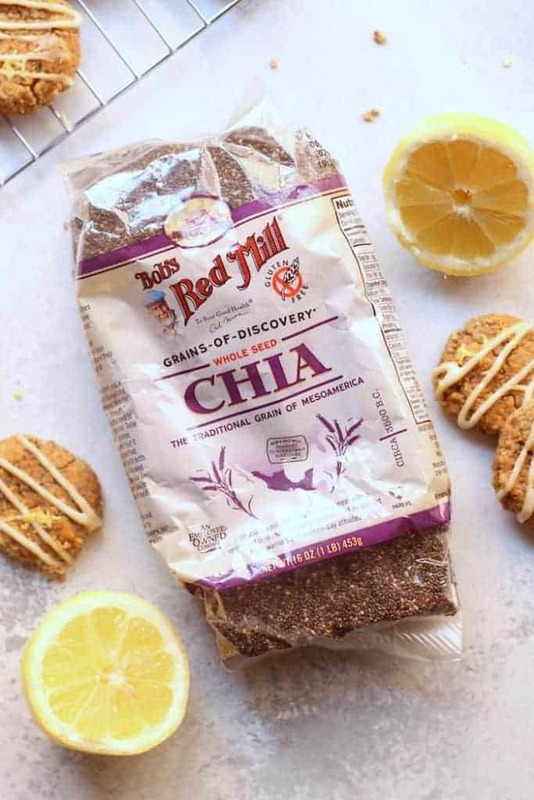 Lemon poppyseed is very much a thing and seeing as chia seeds look almost identical, I used my fave Bob’s Red Mill chia seeds in these cookadoos. They’re soft, slightly sweet, pillowy dreamboats kissed with lemon and puffed up like a cloud drizzled with a bright lemon glaze. They’re free of eggs and dairy and refined sugar and refined flour because I ate all those things this weekend and there’s none left for the rest of the world. In case your brain is wondering, I used this coconut flour, this almond flour, this coconut sugar, and this yogurt in this recipe. When life gives you lemons…make these! Place cashews for glaze in a bowl. Cover with hot water and set aside. Preheat oven to 350F. Line a large baking sheet with parchment paper, a Silipat, or spray with cooking spray. In a medium mixing bowl, stir together almond flour, coconut flour, coconut sugar, chia seeds, baking powder, baking soda, and salt. In a medium bowl, stir together yogurt, banana, lemon juice, lemon zest, and vanilla extract. Add wet mixture to dry mixture and stir until combined. Let batter sit for 5 minutes. Form rounded tablespoon balls of dough and spread evenly on baking sheet. The batter should be somewhat soft and sticky but should hold together when you roll cookies into a ball. Pat each cookie down lightly with fingers since they will not spread in the oven. Bake for about 23 minutes. Meanwhile, drain soaked cashews. Place in high-speed blender (I used my Nutribullet) with the rest of the glaze ingredients. Glaze should be completely smooth and creamy. Transfer to a small bowl and freeze until cookies have cooled. Remove cookies from oven and place baking sheet on a cooling rack. Allow to cool completely. Use a fork to drizzle glaze over top. You can also put glaze into a plastic baggie, cut off the corner, and drizzle that way. Store cooking in an air-tight container in the refrigerator. This post is sponsored by Bob’s Red Mill, one of my favorite brands that I’ve been partnering with for years. Thanks for supporting the brands that make it possible to run Hummusapien! For more yumtastical recipes and a coupon for $1.00 off any product, visit Bob’sRedMill.com. Ooo I’ve never had a cookie with chia seeds baked in! Love the idea- they seem nice and chewy! I think it’s awesome to slow down and take it easy every once in a while. It’s great that you did that. The cookies sound and look great! I love the flavor combinations in this recipe! Especially adding the maple syrup to the lemon glaze…sounds so delicious and summery! The cashew lemon glaze sounds so good! Ohhhh girl, I hope you feel better soon! Being sick is never any fun, and hormones-on-parade always blows too. Just think how good you’ll feel in a few days!! DEEZ COOOOOOKS! I need these beauties! I love combining coconut flour and almond flour! The recipes always turn out so well. OMG. My mouth is watering. Can’t wait to make these. Get well soon! ughhhhh, I was in the exact same boat. The weather here was the nicest its been in forever, and I was dying with allergies/flu/something awful. no fair! OMG. Who doesn’t love a good glaze? I made these last night and they are SO. FREAKIN’. GOOD. sometimes chips and good podcast is all you need! hope you are feeling better. Ugh, I got sick recently too. Such a crappy time of year to get sick! Hope you’re feeling better now. I made this and love it! Kind of the flavor profile of a lemon poppy seed muffin but without the guilt (no regular flour or refined sugar or oil). Of course mine don’t look as pretty as yours (I just smeared on the blob of icing) but the taste! Very lemony. I’ve been trying to avoid using coconut oil (what are your feelings about the new American Heart Association report about how it’s not the wonder oil we were led to believe?) but I figured I’d rather be happy than “right” or such a purist—-one Tablespoon of oil divided among all those cookies surely isn’t going to have any negative health ramifications—and will have positive ones (lifting spirits, adding some pleasure). And actually I have met almost totally fat-free vegans and it’s not pretty (energy level, skin and hair dull)—I know some people will chew me out about this and perhaps they’d be like this anyway even if they ate some fat. I know you are very busy now and developing/posting recipes on here is not a priority, so please know that when you do, it is very much appreciated and always worth waiting for. Your style, creativity, writing, photographs are very impressive. Wow! This looks really good. I love that it’s soft and chewy and I am so excited to make this. Glad I have some chia seeds available. I just need to grab some coconut and almond flour. I would like to say thanks for giving us right to use and generate resources of sims free play. what can i substitute for yogurt ? Hmm I’m not sure, dairy-free yogurt if you’re looking for vegan?